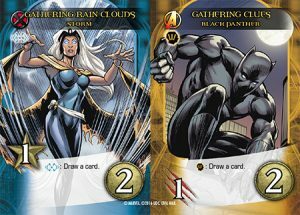 The next expansion for Legendary®: A Marvel Deck Building Game highlights the classic Marvel Comics story ”Civil War”. The story arc forced superheroes to choose a side. The newest type of card introduced in Civil War will do just that. 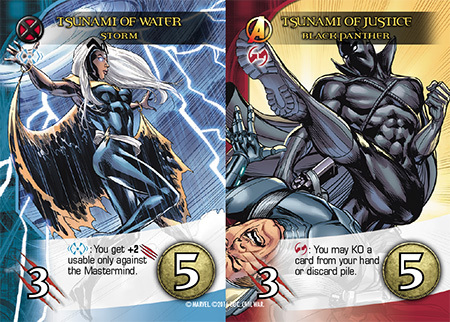 Matching theme of division and duality, Civil War introduces ”Divided Cards” which have two miniature cards printed on the same card. Divided cards are able to be recruited from the HQ as normal by paying its cost. Each side of a divided card will show the same cost. This cost only has to be paid once, not a total of both sides. While a Divided Card is in your hand or the HQ, it counts as all its Hero Classes, Teams, and Hero Names. But once you play it, the card only counts as the side you choose. Different sides of Divided Cards often let you choose between Recruit, Attack, drawing cards, and other effects. Choose carefully which side to play! When you play a Divided Card, you choose which side to play. You generate all the recruit, attack, and special abilities of that side as normal. You ignore the other side, as if it doesn’t exist. Each side of a Divided Card has a different class. 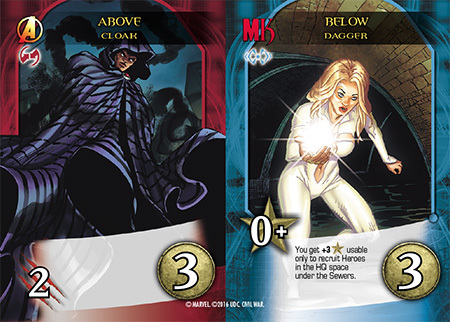 The class on the side that is played will trigger Superpower Abilities on cards later in your turn. 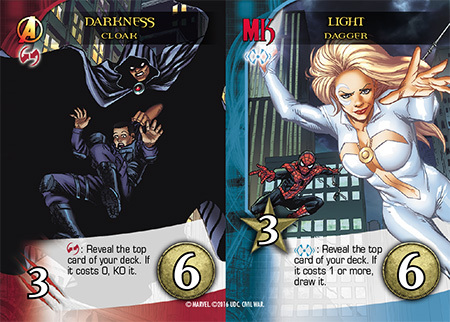 Cloak and Dagger share all of their cards, as do Storm and Black Panther. Every other Hero in this set will have one divided card. Some of these cards will have a special appearance by a character that has never had a Legendary card before. Who do you think will make an appearance? Do you choose a side once a turn or choose per card played? My initial thought was per card but a friend thought per turn was more thematically correct. Each time you play a Divided Card you choose which side to play. Not a fan of this :-/ Kinda convoluted and cluttered; also takes away form the heroes individuality. I like to collect the heroes and play them the way I want, in scenarios that I want. 2 different heroes on single cards disables that. I am super excited about the up and coming expansion. So many heroes that I have wanted to play for so long like Luke Cage, Vision, Falcon, etc. I am also excited to check out the new Divided mechanic that you are implementing. Thanks for all of the hard work. My wife and friends are grateful to have another Legendary expansion to check out. We have been playing for the last 2 years. You guys rock! unfortunatly i don’t like the fact that you know what card you are going to draw next. But i’m not carving this in stone, can’t wait to test this myself. The release date is August 3rd. The timing for Europe depends on the shipping choice our European distributors make. This can take some time.